From Wartrap to the foothills of Sathuragiri Hills, there are only passenger autorickshaws that take people in group. If you prefer to get jam packed into it sometimes ending up in someones lap or someone ending up in yours, then only Rs.10/- per person and if you dont want all this to happen Rs.80 to Rs.100/-. We preferred one auto for five of us and reached the foothills in another 20 mins. At the foothills, just a small tent housing few snacks and cool drinks and tea welcomed the very few people who came here. The lady who seemed to make a living from this small trade, was kind enough to offer us water. To keep up with her generosity i bought some chocolates and biscuits just in case we may need them in the 5-6 hours trek up and she was happy about it. She wanted us additionally pack into us some deep fried stuff stating that we would not get anything further but we politely refused. We began the trek. 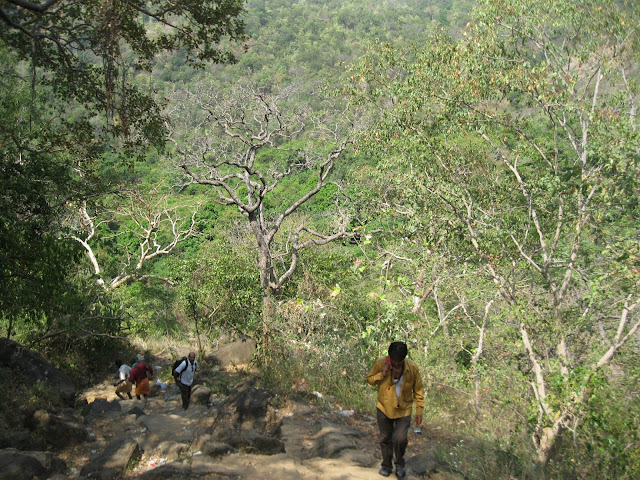 The trek was sometimes narrow, sometimes rocky, sometimes plain, sometimes steep. 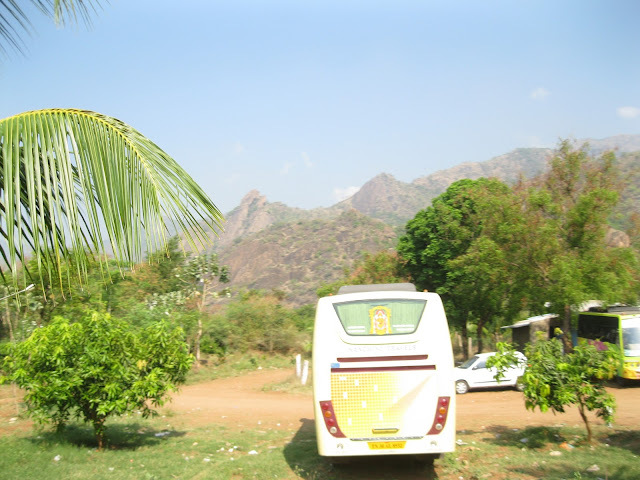 The Sathuragiri Hills comes from the name Chaturagiri or Chatur meaning "four" and giri meaning mountain. So this is the four mountains representing the four vedas. 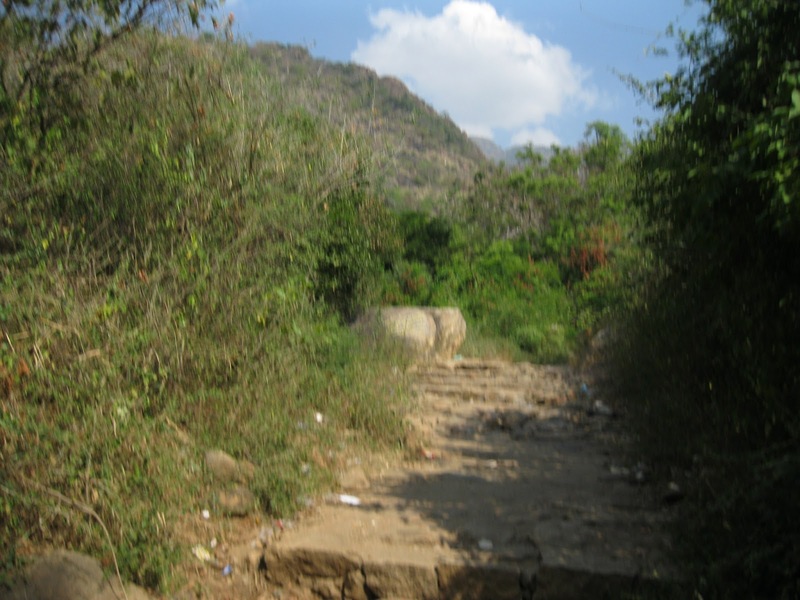 These hills are mysterious and known to be the abode of all the 18 Holy Siddhas of the South not just in those days of physical reverence but even today they are known to be in and around this place, especially known to be worshipping Shiva in the main Mahalingam Temple on the top, that is about 4500 feet above sea level. 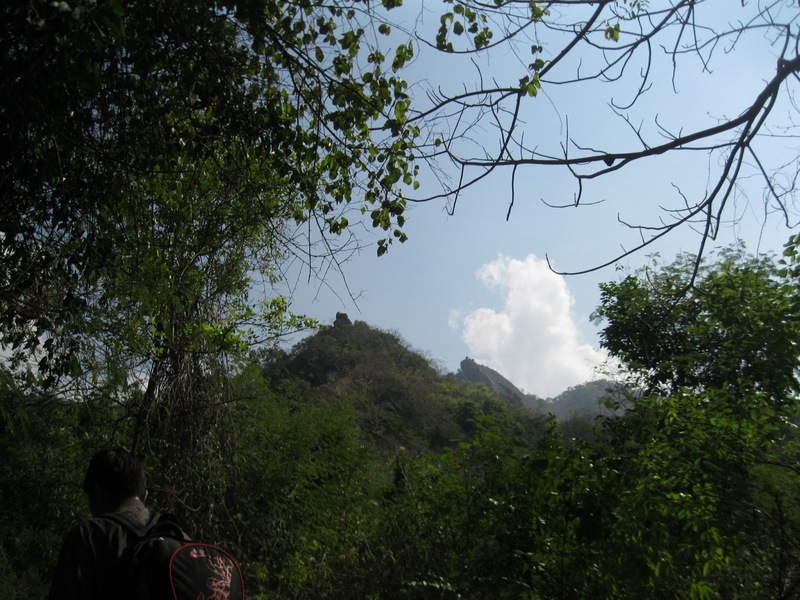 There are actually four routes to reach the top and the Thaniparai route was considered the most safest because there was some public traffic on this route, which is the route we had taken. 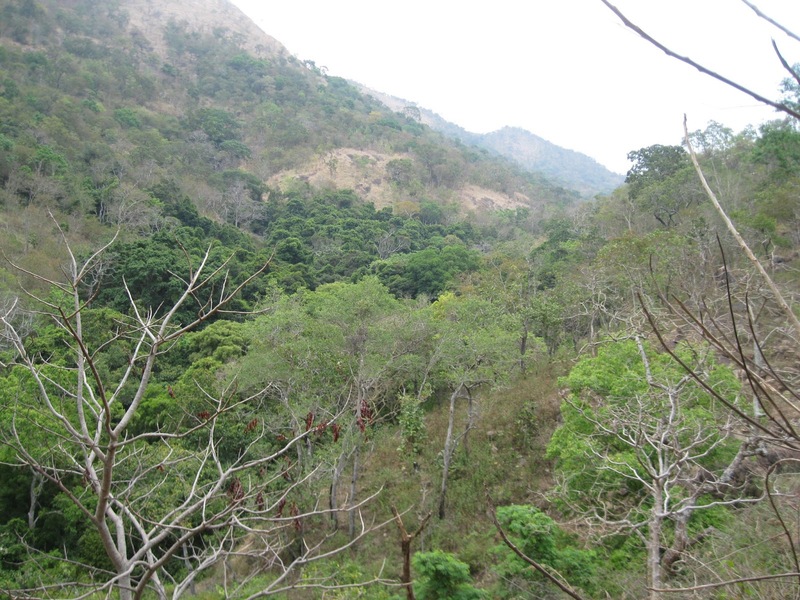 Most of other routes were either closed or needed guides to move up with or needed permission from the Reserve Forest because these mountains are actually forests, also with wild animals. 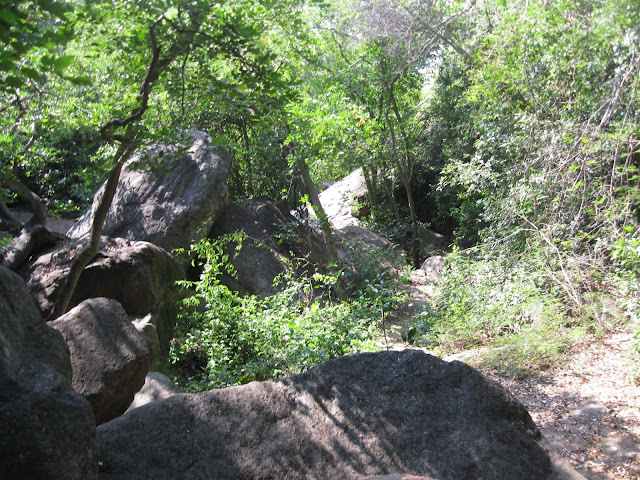 It is always advised that the trekking up or down done before dark because of the risk of wild animals prowling at night. Often we would see some devotees in small groups moving with empty plastic bottles in both hands and hitting the bottles to create noise and that was to ward off any wild animals. Often as we moved up, we were alone just among ourselves or we encountered small groups coming down. Most of the while we kept silence and being 'connected' as we walked up unless it was really necessary to talk something. 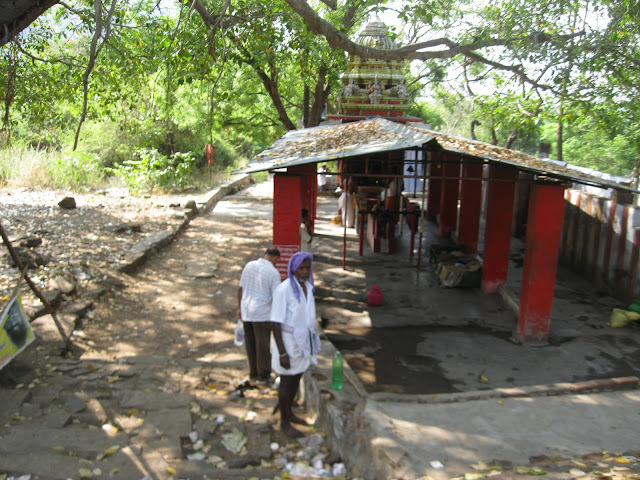 In such locations, the benefit does not lie in just reaching the top of mountains or to the main deity temples but what helps is how much one is connected with the source while going to the main spot or darshan. It is simply because such places are full of high spiritual energies that work on our subtle bodies whether one is aware of it or not. The deeper one is absorbed in pure awareness of the moment, the better experiences or connections will happen. It is also true that the divine beings and Holy Masters are in contact with the seekers here and it may be in any way, subtly or with physical encounters. But, if one is not 'aware' one will never realize this. They can appear in any form from a beggar to a bird to an insect to a man or woman. Best is not to judge ANYTHING and treat everything and everyone with reverence. Sathuragiri Hills is also known as Mahalingagiri, Menugiri/Merugiri, Kailasagiri, Indiragiri, Sarvalogagiri, Suriyagiri, Brahmagiri, Siddhagiri, Yamagiri/Yemagiri, Sivagiri, Sakthigiri, Udayagiri, Sanjivigiri or simply Sivan Malai (Shiva's Mountain). This hill is visited by thousands of devotees on a full moon day. At Thaniparai entrance, sanctums of Lord Ganesha, Rajakali Amman, Pechi Amman and Karuppanna Swamy. 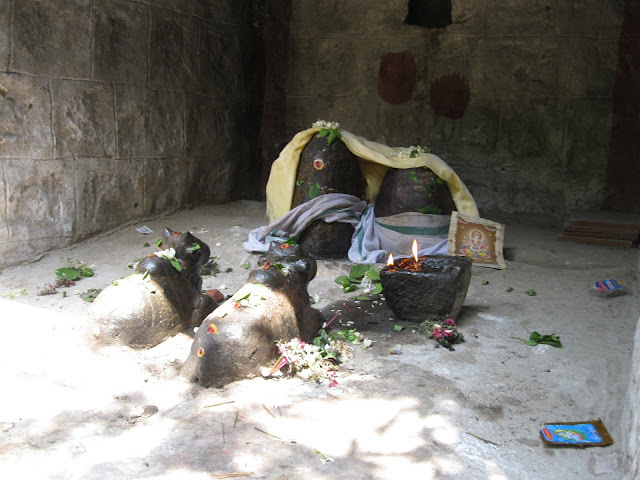 At Gorakunda (Gorakshnath) Kunda, two sanctums of Shiva Lingas inside two different caves. On the way up twin Lingams inside a sanctum called "Rettai Lingam". These are Sankaran Narayanar Lingams. 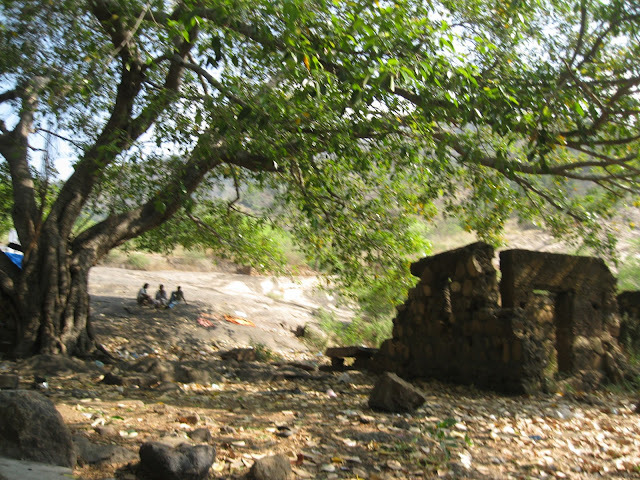 In between the Sundara Mahalingam and the top of the hill one can find these sanctums in the deep forest. Thavasi (or tapasvi) Caved to be there and without whose permission one cannot reach there. 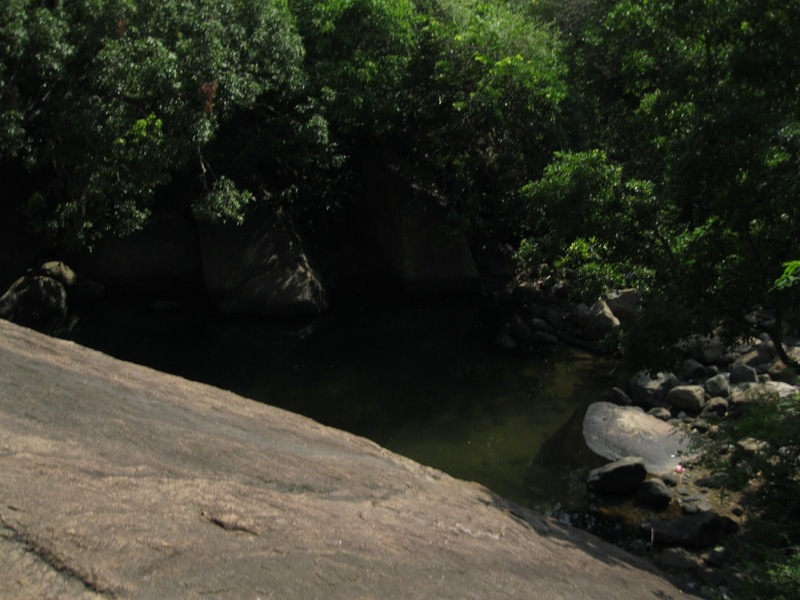 When we reached Naval Ootru that is a sacred water body or the Akasha Ganga that flows from above the Santhana Mahalingam temple. It is just below a jamoon tree and its water tastes like Jaman and is said to be good for diabetic patients. We then suddenly noticed two dogs with us and one of them literally were with us for a long distance climb. They would walk when we walked and stop when we stopped. In certain areas when we just felt like sitting and meditating we stopped and sat down and the dogs also sat down with us. It kept us company till we reached a small pool. We stopped there for a while in contemplation and the dog suddenly ran up into the trees. We followed it and a few meters inside the trees and dry leaves the dog stopped. We did too. 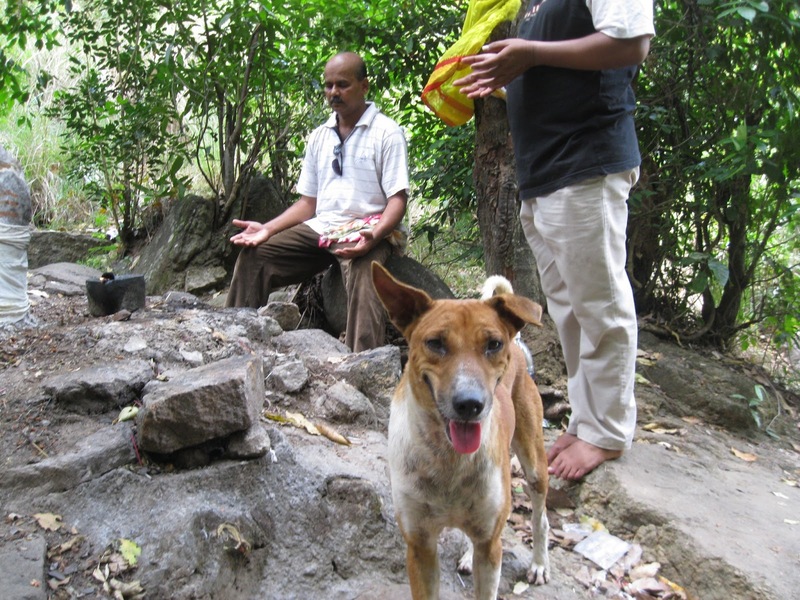 it stood at a place for a while we decided we must sit there for a while and as we did, the dog also sat with us. After sometime we got up and came down back to the main tracks and the dog also came with us down. The biscuits we carried came handy for these dogs and also some monkeys that we met a one location. They were stray dogs and were just with us. As we looked down into the prints to see what next location was coming and walked a few steps, the dogs were not there. It seemed as though their journey was only till there with us. We walked and walked and walked not focusing much on the scorching sun not the heat not anything about tiredness. It helps not to during such journeys. Keeping one's awareness in oneself or even one's koshas or sutble bodies during such trips work wonders. i kept two things going on in one of the cellphone - Babaji's bhajan on the Mother and a brief mantra of Gorakshnath ji. This helped a great deal to stay focused. Since this was our very first time here and we had only read about this place, we did not know if we would have to return back the same day because we were unsure of any accommodation on top. That is one reason we had started our day so early so that in case we do not get an accommodation to halt overnight on top of the hill then we should have enough time to get down the hill before it was dark. We had left everything to the divine will and were just making our way up. Finally, we reached the 'Vana Durga' where we all sat down for a while and meditated since it was conducive to sit there. As we were getting up to continue we saw a young boy in his sporty outfit with a bag over his shoulders asking us where we were from. We exchanged some communication and it was revealed that he came here often as he stayed not very far from here. He mentioned he was Satheesh. On knowing that we had come here for the first, he curiously asked us if we had met two dogs on our way. We were astonished to hear this and when we told him our incident with the dogs, he laughed and said that they are known to meet first timers and mentioned that he also on his first visit had met them. Nobody wanted to talk more on it as we did not want to find out what it was or interpret anything or allow the mind to create it's own stories of pride, so we let it die down but somewhere deep inside we were happy to the core. The boy then asked us if we had place to say and we denied. He then looked at his watch and said that we could make it to the top temple ashram by lunch time, 1 p.m. He mentioned that they served free food to devotees but within that time frame and that he knew the people there and would tell them about our need to stay. We thanked him and continued the rest of the trek with him. We reached the top by lunch time and it took us only around 4.5 hours to reach here. As we almost reached the top i saw some cattle and a small calf was grazing. She looked cute and i touched her and communicated with her sending her love energies, a gift that came from the teachings of my Guru. i was saddened to see that her back was bleeding and Satheesh mentioned it could have been attacked by some wild animal. i couldn't take much of it and was praying for this little one as it walked away into the thorny bushes. We reached the top and first went and bowed at the Sundara Moorthy Temple in which is what is known as the Anidai Lingam that is at the entrance of the small covered area. 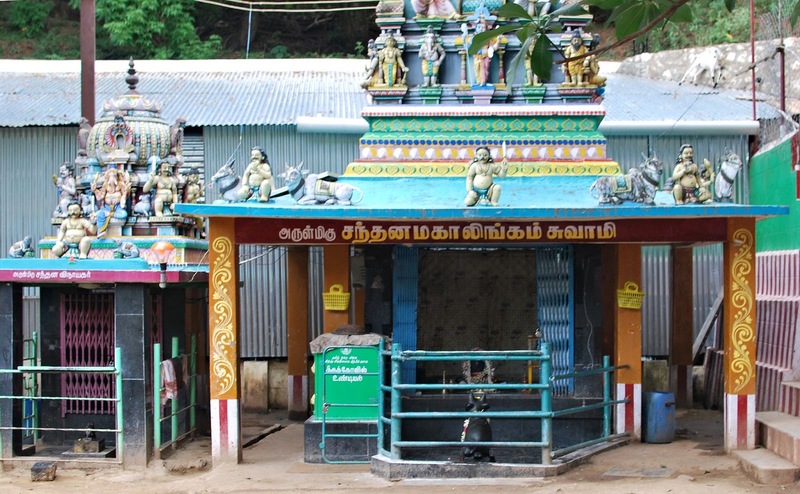 Sundara Moorthy Swami is the disciple of Sundara Mahalingam, which is situated a little further above this temple. The story behind this is that Lord Siva was looking for a priest for performing the daily puja here and He found a 3-year-old child in a nearby village, who grew up to be an ardent devotee of Lord Shiva. It is said Sundara Moorthy Swamy is much more powerful than the Lord Sundara Mahalingam. All pray to Sundara Moorthy & would request him to pass on their prayers to Sundara Mahalingam. Lord Sundara Mahalingam would ensure that the prayers that came through Sundara Moorthy Swamigal be answered promptly. All the Siddhas, including Siddha Agathiyar & Siddha Sundaranandar, are known to have been worshipping this Shiva Linga and even today. After that we proceeded to go to the main Sundara Mahalingam Temple. This is Lord Shiva himself. 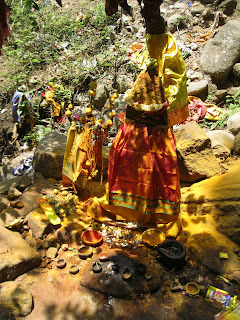 To have a darshan of Sundar Mahalinga devotees carry out the tedious trek on the Holy Sathuragiri Hills. One can notice that this Shiva Linga is tilted, which has a story behind it. One of Lord Shiva's demons called "Yaazvalla Thevar" fell in love with the aide of Maa Parvathi named "Deivanangai". Lord Shiva who knew this, sent them in the form of human beings to Bhooloka (Earth). The demon was born as "Pacchaimaal" and Deivanangai was born as "Sadainangai". Both got married and were living in a place called Kottaiyoor at the foot of this Sathuragiri hills. Soon it was time for Pacchaimaal to return back to Kailash after the curse. 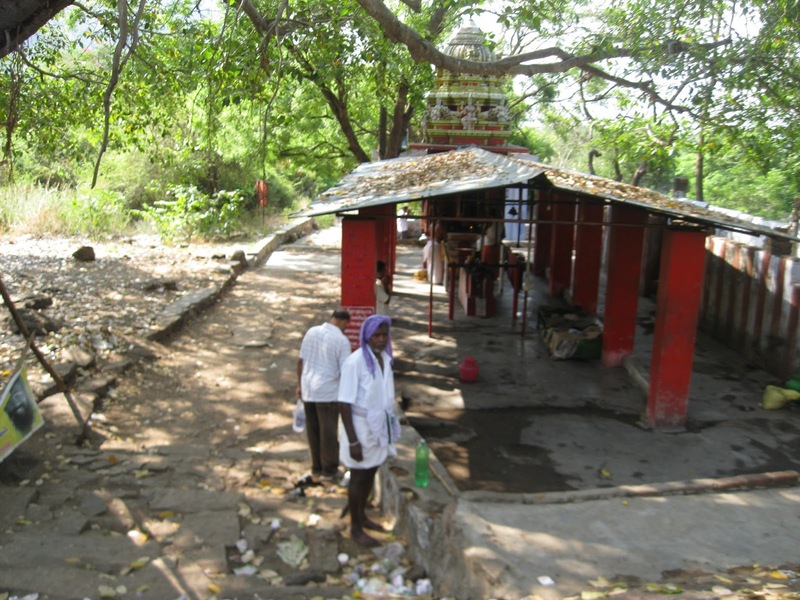 At this time, Lord Shiva himself took the form of a saint and came to this place. He drank the cow milk that was supposed to be offered as the Lord's Abhishekam. When Pacchaimaal saw this, he was angry and with a wooden stick struck his head. When Siddha Sundaranandar arrived, he saw this wounded saint and saw the Lord's real form. Lord Shiva then told them his intention of coming there and everyone prayed to Him that he stay there and bless all those who come there. 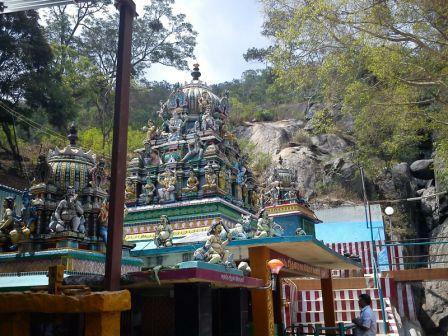 Lord Shiva agreed and stays here as "Mahalingam". 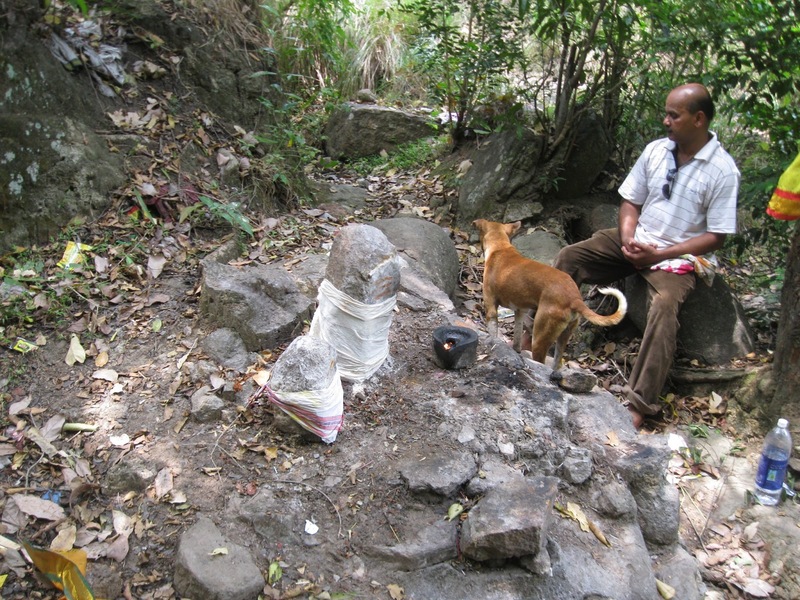 Because of the blow from Pacchaimaal, one can see the lingam tilted to about 30 degrees to his left. 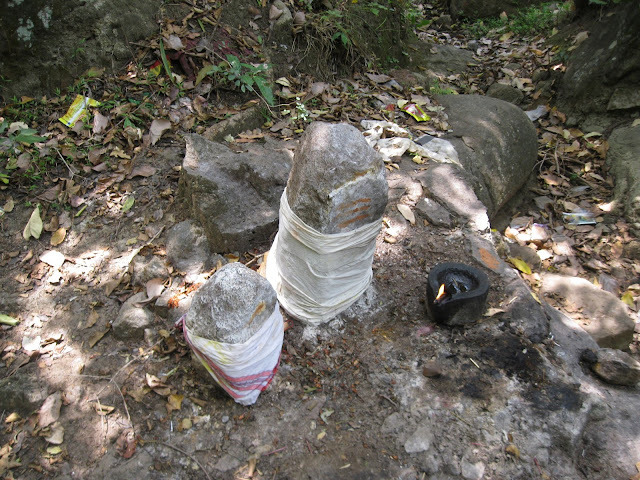 We can also see the cut on the head of the lingam. The above picture may just look like a snapshot of the Linga but in fact just to have one darshan of this Mahalingam, people flock here regularly and the Siddhas themselves worship this linga. It is very auspicious and powerful to even gaze at the photograph. 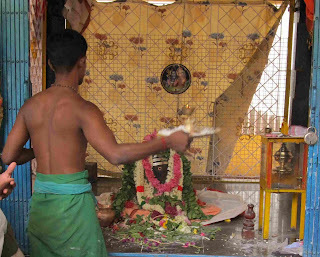 A curtain covers the Mahalingam and is unveiled only at puja times. We sat there for the puja and as we sat there, i was pleasantly surprised to see that little calf whom i had met down come towards the temple. i was watching where it was heading to as there were other calves with it. To my surprise it moved away from the other calves and headed straight towards me and came and halted in front of me. i immediately prayed to Babaji and invoked Sanjeevani and kept my hands on it's head as a gesture to send love to it. i could sense energy very rapidly flow out of my hands and it stood there seemingly enjoying it. After a few minutes, i literally experienced a current in my hand and it was so zapping that i had to pull my hands off. This little calf was something! i went and sat with my friends and the calf walked into the temple and stood there, until the priest who came for the puja shooed it away. Then i never saw it. 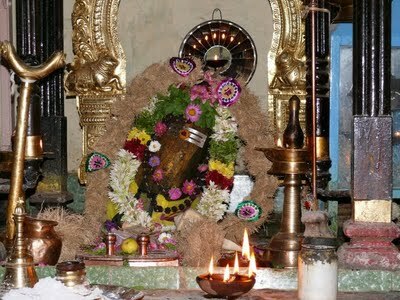 Soon the curtain unveiled and there was a short puja and a hymn sung and we had the darshan of Lord Sundara Mahalingam. The puja ended with the prasad and vibhooti and applying it, we walked towards the small ashram. All this while Satheesh was guiding us and our gratitude to him for having met us at the right time and brought us here and also introducing us to the ashram head mentioning that we wished to stsay overnight. He asked from where we came and agreed. This ashram is a very small ashram. 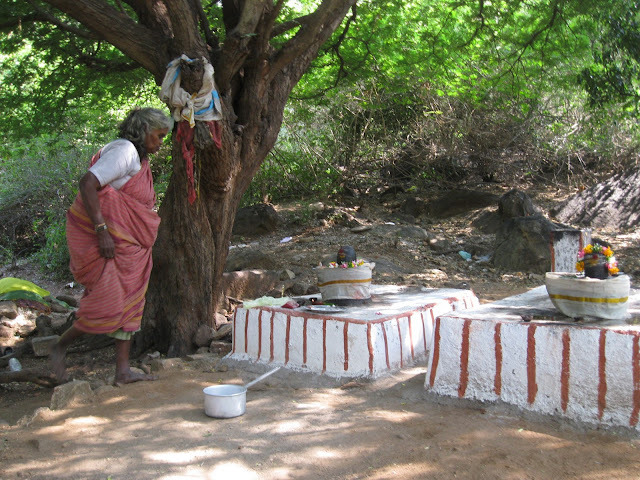 Kalimuthu Swamigal Ashram or Kanji Madam (meaning porridge inn) was founded, by Badrakali Amma in 1972. She would prepare kanji daily at home and carry it to to the top here to distribute to the devotees and sadhus. Her son was Kalimuthu Swamigal, who continued with this work. He would travel to nearby places begging for money and food. All this would be donated to feed the devotees at this Kanji Madam and for building a temple for Anandavalli Amman (the Lord's consort who was sent by the Lord to kill a demon). Kalimuthu Swamigal along with 107 swamis regularly went on padayatra (journey by foot) for 3 months every year in order to collect money and food items. With conducted pujas and yagyas for people who were going through a bad phase in life. He was also closely associated with Thalai Aatti Siddar Swamigal of Perambular and Kalidas Swamigal of Palani, who were Siddhas in the same period. Kalimuthu Swamigal attained samadhi at his ashram in S. Ramachandrapuram, 15 Kms from Srivilliputhur. We then sat down for food and simple delicious food was served. We washed our plates and looked around the small room that was continuously serving food to those who came there. The head person told us that we can spend our night there. This house had two rooms, both of which were used for serving food in the day and served as shelter in the night. The floor was uneven plastered mud and cow dung but cooler than the high temperature outside. We were grateful we had a shelter otherwise we would have to head back the same day. Satheesh said that he had to leave back soon and asked us if we wished to join him to the Santhana Mahalingam Temple which was at a little more altitude from here. All these names were confusing and i am sure you too are... lol... it took me some time to get things clear and most of the things i learnt after i came back and most of the things now, as i had to refer to things. So, thankful to this blog also for the opportunity it gives to get deeper into these aspects. So, we headed with him and it was a steep climb of many stairs. It took about 15 minutes to reach there and once we reached, the scene around was magnificent. From here we could see the Sundara Mahalingam temple and the hills of Sathuragiri around. 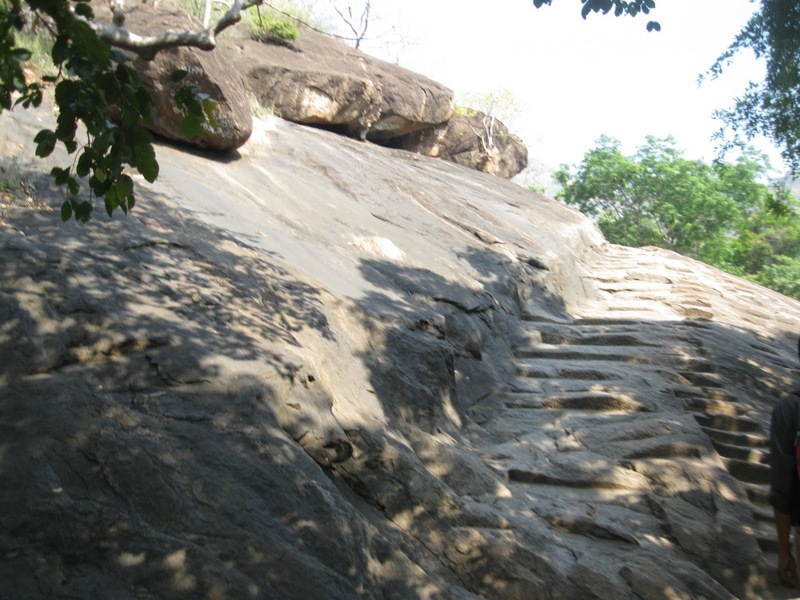 We could also see far on top of the same hill called "Thavasi Caves" which had a steep climb and was known to be still housing many Siddhas. One could go there but with the help of the local adivasis (tribes) without whom it would be dangerous, as one could get lost and also not know the routes to get there. 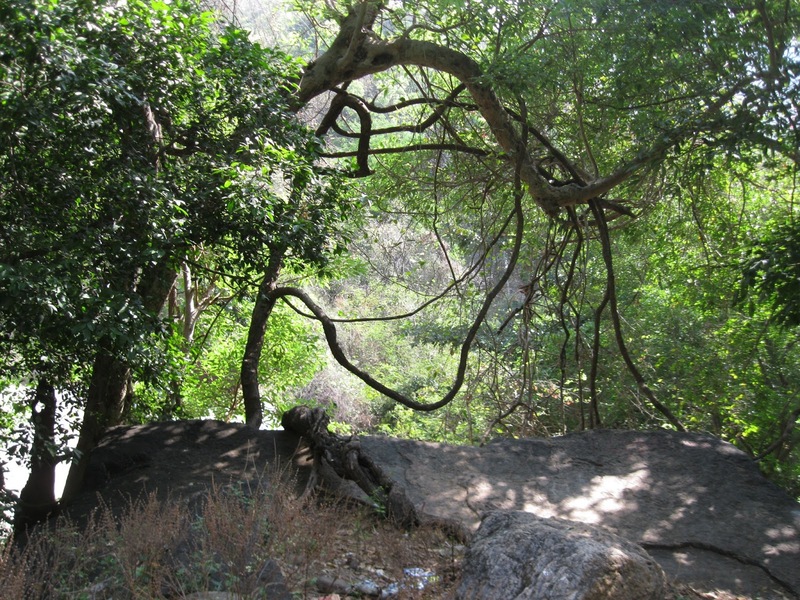 It is also believed that without the Siddhas permission no one can enter there. Few people visit there with the tribes. 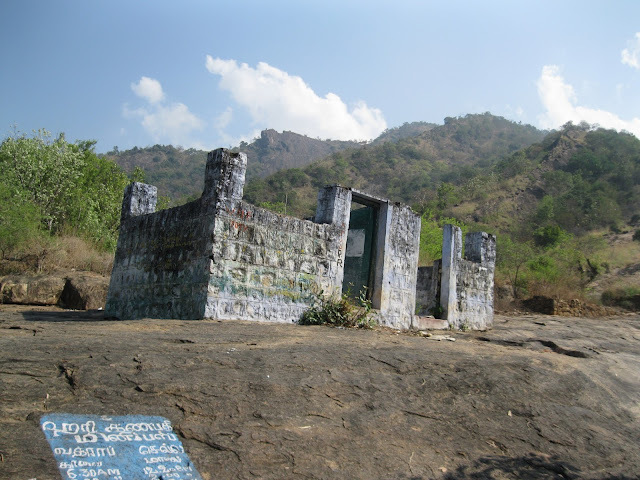 This was the highest point of Sathuragiri Hills and had a huge rock shaped in the form of a Shiva Linga and known as Periya (big) Mahalingam. Unfortunately, we had to leave down the hill early next morning and would not be able to make it to the Thavasi Caves inspite of having help from the local tribe, who became friends with me after a few conversations. 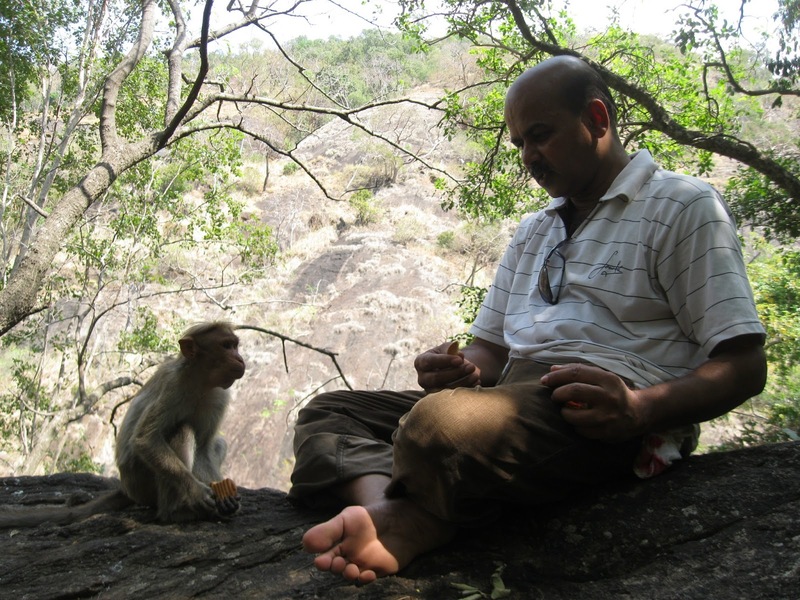 He even ushered to help me with our forthcoming stay in Palani Hills. So, we we reached the top of Santhana Mahalingam Temple, and i was busy clicking pictures, to which suddenly the temple priest objected and i slid the camera into my pocket. He was a huge swami or a yogi with long matted hair and wore just a cloth around his waist. There was a Shiva Linga here and he did the puja and offered us bhasm and prasad. He looked unhappy with me with the look that are often given to ignorant tourists. On asking him about the Shiva Linga here he spoke in Tamil quite fast and i could not understand much. Then we sought his permission to meditate around and he agreed. We took our locations around the rocks and sat for sometime there. Satheesh bid us goodbye and we thanked him and he left. When we came down, i tried conversing with him with the bits of Tamil. Everywhere during our travel down South it was my broken Tamil that helped in conversation and i attempted it here again. Soon, he realized that we were not there for sight-seeing and then became very conversant talking about Siddhas and their ways. He pointed to a direction and asked us to go inside and meditate. We went into a little room that was housed at a little height and had some stairs to reach there. We went in that room and were surprised to find nothing but one room itself but with a cave opening. At the small mouth of the cave were lamps burning and i realized this was not were people were allowed. But a careful look at it showed that it was deep. We were not allowed to meditate there for some reason by the person who looked after that house. He asked us to leave. Coming out, i talked to the yogi again who smiled and said that he could not do much about it as it belonged to the trust there. Feeling a little disappointed, i decided to come back here later. The yogi had become friendly and started asking me one after the other place names if we had been there to which i kept answering with a yes or no like objective question-answers. He then told me which all places belonged to which Siddhas and the Jeeva Samadhis. i took made quick notes. He asked us to visit Karur where there is the Jeeva Samadhi of Karuvurar. i replied that i feel i have heard about the place and frantically checked my list but it was not there. i told him on the list was Karuvurar but the place of samadhi was elsewhere to which he said there are always controversies about samadhis. Since Siddhas are not even bound by Samadhis they can even take multiple samadhis and different locations. All these are deeper mysteries of the Holy Siddhas. Suddenly i remembered and exclaimed to him that Karur was the place we had booked our train back home. We have never been there and the only train from this area location back home passed through Karur and therefore we had booked from there. i was happy to know that there was a Jeeva Samadhi here too but was little apprehensive as we would have very less time to hunt for it when we would reach the railway station to which he calmed me with a big laugh stating that it was located at walkable distance to the railway station. i was overjoyed and translated this to the already joyful looking friends, as they had sensed with my joy that i had struck something somewhere. i wanted to be near this cave where we were not allowed and asked the yogi if we could come back by evening to which he said the temple closes after the 6 p.m. puja and advised us not to come there after dark due to wild animals. Thanking him wholeheartedly we fell at his feet and he blessed, still laughing. We came back to the Kanji Madam and then spent the rest of the day in meditation and 'silently' walking around. We had tea at the little stalls and it seemed there were just four or five little shops around here. A little further down there were few little stalls that sold tea, snacks or herbs. At one place we sat down for tea and the person asked our whereabouts. They had question marks when we mentioned we were from Karnataka and Goa and they asked who was our Guru and i showed him the picture of Babaji and told him that we are also from the same lineage of the Holy Siddhas :) He gave us some good inputs of people and places around. At night, we had food at the same place and we were asked to take gunny bags to retire for the night. Gunny bags were used to put on the ground and lie on it. Wow! This was something. But, soon we saw people were already settling down and we preferred to sleep out. We asked for permission if we could sleep in the Anandavalli Amman temple. This temple was nothing but a small room in the center of which was a small elevated cemented square platform with nothing on it. Though there was nothing on it, this square was protected with chain rope on all four sides so that noone go beyond it to the square. This Satheesh had explained was the sacred space of the Mother. He also said that on certain days she actually takes the sthool roop (form) meaning she appears there in form and people have seen it. We positioned our gunny bag sheets on the floor here and laid down. i must have slept for a few hours but then was woken by the bells of the cows that also were resting inside this dark hall/temple. Soon i felt a warmth near my legs and with my torch discovered a white dog cuddled up at my feet for warmth. The temperature had dropped down and it was cold. Early morninng 4:30 a.m., me, Shyam bhai, Ram bhai and Suraj bhai got up and left out for freshening up.